It seems that India after losing its two aircraft to Pakistan and a pilot being captured, though later released by Pakistan as a gesture of goodwill, has not let India to cool down on its failures. On night 4 March, the Indian Navy submarine tried to sneak into Pakistan's territorial waters but the bid was timely detected and "locked on" but again let go in order to escalate the already volatile war like situation between Pakistan and India. 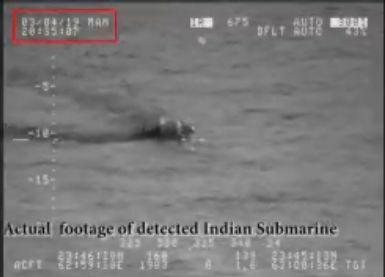 Pakistan Navy has released a purported footage of the intercepted submarine, shown moving with its periscopes over the water surface. The statement said the Navy didn’t engage the submarine, but was proud of its success in detecting it despite India’s large investment in modern submarine technology.